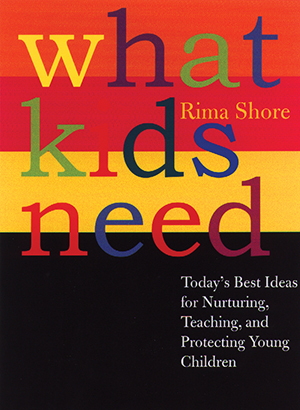 What Kids Need is a compelling case for making the welfare of all our youngest a national priority; it is essential reading for those who work with children and for parents who recognize that the future of their children is profoundly connected to the well-being of all youth in America. Drawing on a decade of research on children up to the age of ten by top experts, What Kids Need challenges the belief that early risk factors and problems severely constrain a child’s life chances. This groundbreaking and encouraging book explores the range of effective parenting techniques and social supports, programs, and policies that really work. While politicians, parents, and educators across the political spectrum call for improving the lives of American children, What Kids Need lays the groundwork for bringing this goal within our reach. Can we put to use our knowledge-about how children develop, how they acquire the skills and concepts needed for success, and how families, communities, and schools can support their healthy development-so that all American children can thrive? For over a decade, the Carnegie Foundation has funded research on the needs of children and has been at the forefront of the early education movement. The foundation promotes programs and policies that better the lives of families with young children and seeks to broaden public interest in their future.